Blondie and Brownie: Back to Work! and Financier. The odds of me not going to the new Financier in the 72 hours I actually had work before my holiday break: 1 in ∞. Let's talk bûche! I find trying bûche de Noëls a hard task to fulfill mainly due to their very specific existence as French Christmas cakes. 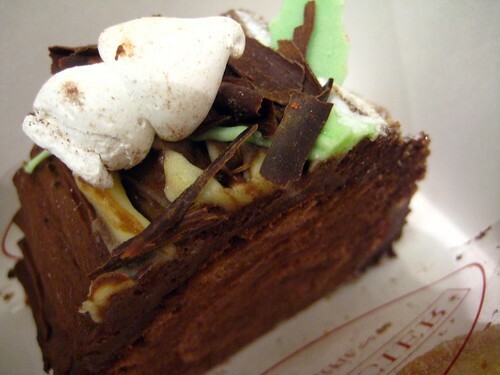 Of the number of places that make them during the holidays, only a few succeed with good cakes. And quite frankly, I eat way more than enough during the holiday season, I do work in an office with a number of vendors and baked good-holics, so going out and tasting new bûches isn't a top priority at all. 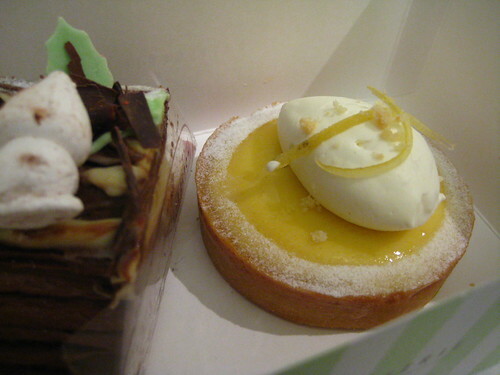 I did already have one tasting under my belt, so when I saw that Financier was selling slices of theirs, I went for it. If it's good enough for Mr. Jacques Torres, it should be better than fine for me. Needless to say, it was awesome-chocolatey, but not too overwhelming or cloying. Perfectly balanced buttercream with a respectable Génoise (not too moist or too dry). Easily the best bûche de Noël available in the East Midtown area! Ginger had come with me on this afternoon snack time run. Not feeling a heavy, chocolate cake, or something FILLED with cream (we're looking at you, éclairs! 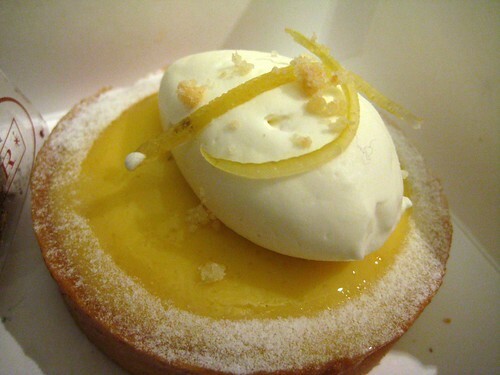 ), she picked the Lemon Tartlette, a sunny, summer-light dessert. Imagine the juice from the most perfect, yellow, tasty lemons boiled down, mixed into a mousse, then piped into a sweet dough crust. Like sunshine in winter, folks, sunshine in winter. Tart, sweet, dense, creamy. And now that it's the New Year, time for the next francophile specialty dessert, the Galette de Rois! The whole of Grand Central is a big delicious enticing money pit for me on my way to/from work. It's so crazy that so many great tastes can be in a "train station." These looks great!